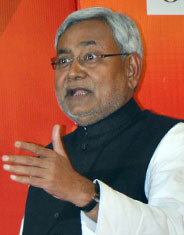 Nitish Kumar’s appeal to banks: Help Bihar achieve rapid and inclusive growth. Now! Poor banking practices are proving a big hurdle for the Bihar government in reaching out to the poor and ensure rapid and inclusive growth. While the state wants to transfer cash directly to the beneficiaries of various welfare schemes, non-cooperation and corrupt practices at the lower-level of banking operations continue to thwart such attempts. “Everybody talks about opening no-frills account. But it never gets opened,” lamented chief minister Nitish Kumar as he appealed to the bankers to improve their “micro-management” without which his attempts to take Bihar out of backwardness wouldn’t succeed. He was speaking at the conference, Bihar: Banking on Inclusion, held in Patna on August 25, organized by Governance Now in collaboration with the department of planning and development of Bihar and the Asian Development Research Institute (ADRI), a Patna-based think tank. “We are sad. Bihar is making good progress. There is enthusiasm all around. Such an opportunity comes rarely in the life of an individual, a society or a state. If banks, other financial institutions and the centre help our progress will be faster. At the current rate of growth, it will take 25 years for Bihar to reach the national average. Can we wait for 25 years? We need to jump from the current 16 percent of growth rate to 25 percent and consistently maintain that for many years. Then Bihar will start rolling. I am discussing all this in anguish. Help the students to study and the poor to progress. The state government wants to transfer cash directly to the beneficiaries of our welfare schemes. Help us in achieving this because that is the sum and substance of inclusion,” he told senior bank executives present at the conference. The chief minister recounted how bad banking practices foiled his plans. In November 2005, when he came to power, he wanted cash to be deposited in the bank accounts of students to buy uniforms but banks wouldn’t open the accounts. When he launched the scheme to provide cycles to girl students and later to boys too, he faced a similar problem. Frustrated by the stalling and non-cooperative attitude of lower-level banking officials, he withdrew and set up camps in schools to hand over cash. Similarly, he said when he sought to transfer cash under the Indira Awaas Yojna, bank officials started demanding a bribe of Rs 4,000 to 5,000 from each beneficiary before handing over cash. So, he had to set up camps to hand over money. He found bank passbooks carrying some or other defects deliberately made to make people run to the bank time and again. He also found that the bank passbooks were not in possession of account holders but with others, including middlemen who would demand a cut. When he transferred money under the kisan credit card scheme, bank officials asked for a share of the money saying that the beneficiary wouldn’t have to repay the loan as the government would be waving it off. He also narrated how a few months after his government had paid compensation to the flood victims in 2007, he found people still carrying the cheques with them because they just couldn’t encash it. “I don’t have complaints against senior bank officers. There is no problem with their macro-management. RBI circulars and the finance ministry’s guidelines are correct. There is no problem with regional officers because they are well-meaning and try to get accounts opened and inclusion to happen. The problem is with micro-management. My humble suggestion to senior bank executives is to set right the lower-level functionaries. The problem is nobody at the junior level listens to seniors,” he observed. Absence of bank accounts also meant that the central government’s assistance for poor students to buy uniform couldn’t be availed. The chief minister narrated how he successfully tackled a similar problem. He said he found during his tours that the lower-level government functionaries didn’t issue caste, domicile, income or character certificates without bribes. The idea to enact a right to public services law came from there. The law came into force in August 2011. Now, nobody was complaining. Until now 2.4 crore people had benefited from it. He asked bankers to travel with him to interior areas of the state and listen to the complaints. “You will get direct feedback and then try to set it right… We can do it,” he tried to assure them.